Advice passed down over the generation usually takes the form of “You must do before you die;” whether that is traveling around the world, skydiving or another adrenaline-laced good time. It’s not uncommon – if fact, the phrase probably doesn’t cause much shock or surprise. But to fear that you’ve wasted your life because you didn’t do something, that’s a different story. The week’s featured book has a little tip of its own. 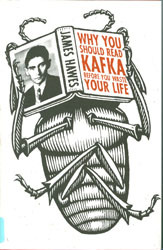 Hawes, a novelist and scholar specializing in German literature and the subject of this book, does not just stop with die, he proclaims that you will have wasted your life by ignoring Kafka. Although Kafka’s Metamorphosis generally qualifies as required reading in many high school/college level English classes, that doesn’t mean you read it (I read it the second time around personally). Either way, the author sets out to dispel the myths surrounding the ‘dark and mysterious’ figure behind the man that gave us nightmares that we’d turn into cockroaches. This entry was posted in new stuff tuesdays and tagged authors, biographies, books, kafka, literature, new stuff. Bookmark the permalink.